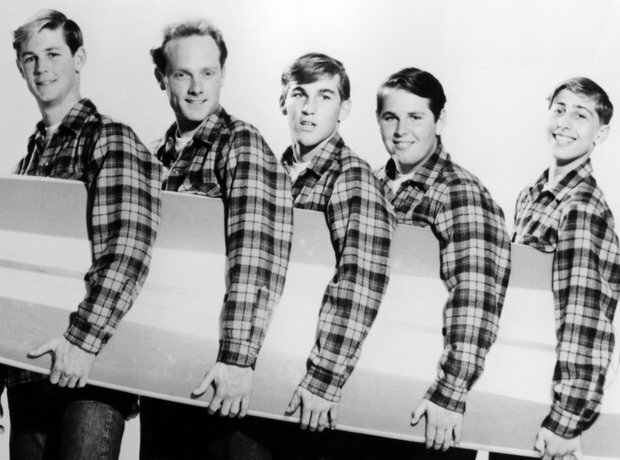 The classic photo of The fresh-faced Beach Boys is this shot of them holding a surfboard. Despite being native Californians and extolling the virtues of the sport in their lyrics none of the boys were that competent surfers. The Beach Boys shown from left to right are: Dennis Wilson, Al Jardine, Mike Love, Brian Wilson and Carl Wilson in 1960. American band 'The Beach Boys'. (top l-r) Carl Wilson, Dennis Wilson (front l-r) Mike Love, Al Jardine and Brian Wilson. This is an undated photo of the rock and roll group Beach Boys at an unknown location. The boys at a reception at the Hilton Hotel, London, soon after their arrival from America for an eleven day tour. Carl Wilson, seen at center bottom, in this November 1966 photo. A founding member of The Beach Boys and lead guitarist for the seminal surf band, died from complications of lung cancer on Friday, Feb, 6, 1998. He was 51.